You are here: Home » Featured » Where Did All the Angels Go? While many of us have felt our angel’s presence at times or at least trust that he’s there, what do all the guardian angels do when people turn from God? Are they still on guard? During an interview with Father Patrick, (not his real name) an exorcist for seven years who is also a parish priest, he explained that people often ask him where is God or why aren’t the angels protecting us and stopping all this insanity? “When the world began, it was the angels’ mission to protect certain areas,” he said. “The world is engaged in a spiritual battle. The angels are part of God’s forces, but they operate under the power of God. If we reject God’s authority over us, then how can the angels help us?” According to him, when we reject God’s laws, the devil easily moves in and has greater influence over us. “The angels have the power to protect and guide us only when we seek to operate under God’s authority,” Fr. Patrick explained. We remove ourselves from his protection by going against God’s plan for creation. The spiritual vision of the saints gives us some insight on angels. Since they walked closely with God, it makes sense that the saints often felt the presence of their angels. Padre Pio had a close friendship with his guardian angel. When he was a young boy, God granted him the vision of his own guardian angel and those of others. At times the guardian angel of a person came to Padre Pio for prayers for that person. Msgr. John Esseff, a priest for in Scranton, Pennsylvania ordained in 1953, and an exorcist in the diocese of Scranton for over 40 years, was a spiritual director for Mother Teresa and met Padre Pio in 1959. Msgr. Esseff once shared with me that Padre Pio told him that if he (Msgr. Esseff) ever needed help while hearing confessions, to send his guardian angel to him. “And it always helped,” he said. Why would anyone send their angel to Padre Pio instead of to God? Angels always act in union with God and he had clearly shown himself through the gifts of Padre Pio. Just as many saints have had the gift of healing, God chooses to manifest himself through his chosen ones. In the book, Send Me Your Guardian Angel, about Padre Pio’s relationship with the angels by Fr. Alessio Parente, OFM, relates many stories. He shared how Cecil Humphrey-Smith, one of Padre Pio’s spiritual children from England, had been in a car crash and was badly injured. A friend went to the post office to send a telegram to Padre Pio to ask for prayers for Cecil. When he brought the telegram to the desk, the clerk gave him back a telegram from Padre Pio assuring his prayers for Cecil’s recovery. Months later, when Cecil had recovered and visited his spiritual father, he wanted to know how it was that Padre Pio got word of the accident so quickly? “Do you think the Angels go as slowly as the planes?” was his reply. Padre Pio told people to remain close with their guardian angels through prayer. 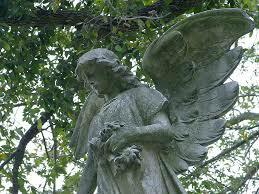 God gave us each our own guardian angel so surely it delights them to hear from us. As Father Patrick explained, they don’t force themselves on us but await our invitation. Extend an open invitation and make friends with your angel—our friends in high places!